We love broccoli. It’s so good and delivers great taste and terrific nutrients to promote good health. You can tell just by looking at it! The best, freshest broccoli has such a deep green color, tinged with purple. It’s a visual as well as a culinary treat. Have I won any converts? Perhaps those who confess to hating broccoli were forced, as children, to eat broccoli, boiled to sulfury excess, the broccoli, not the children. It should be steamed or sauteed, or even eaten raw, as it is often served in a vegetable tray as an hors d’oeuvre. Some people prefer to blanch the broccoli for a minute and then to refresh it in ice water instead of serving it raw. Sauteed with garlic slivers it is delicious. Steamed and garnished with grated parmesan it is delightful. Served with cheese sauce it is dreamy and rich. Added to a stir-fry it is de-lovely. Let’s face it. It’s versatility makes it doggone essential in a well-stocked kitchen. Toss it in a salad. Make it into a soup, or a vegetable on the side use it for a vehicle for delivering creamy dips to the mouth! I’m going overboard here, I realize. So, without further ado, I offer an idea for a make-ahead vegetable casserole using broccoli or cauliflower, or both combined, as their tastes are much the same, cauliflower being a bit more delicate, perhaps. 1. Preheat the oven to 350-375 degrees. 2. Break up the broccoli into large florets. Drop into a pot of boiling salted water and cook for about 4-5 minutes, until just beginning to be tender. Drain the broccoli and set aside. 3. Make a white sauce by melting the butter in a heavy saucepan, adding the flour when the butter starts to bubble. Stir the flour for a couple of minutes to remove the raw taste of the flour and whisk in the milk. Keep whisking to prevent it from scorching on the bottom of the pan. When it is thickened and bubbly, remove it from the heat and add the seasonings and most of the cheese. Keep some back to sprinkle on the top later. 4. Butter a gratin dish or other shallow ovenproof pan. Spread the broccoli in the pan and pour the cheese sauce over it. Sprinkle with the remaining cheese. You may also strew bread crumbs on top of the sauce if you wish. 5. Bake for 30-40 minutes at 350 or 25-30 at 375, or until the top of the casserole is browned. * I prefer to use gruyere and parmesan combined, although cheddar is my husband’s favorite. I made Chicken Divan last night for dinner. I had two chicken breasts halves to cook and plenty of broccoli plus the other items that I needed to throw together. It’s a tasty dish and full of that great vegetable, broccoli. There are lots of recipes for Chicken Divan, from simple to complicated. The easiest one would be basically, cooked chicken cubes, a can of mushroom soup, frozen broccoli (cooked) and cheese, mixed and baked for 30 minutes. From there, you can get as complicated as you wish. My recipe falls somewhere in between the two extremes. I can get everything assembled and ready to bake in under 30 minutes. With another 30 minutes in the oven, that qualifies as relatively quick meal. The time in the oven can be spent preparing a salad, another vegetable, or just relaxing with a nice glass of wine. Sounds like a plan to me. 1. Cook the chicken until tender, remove from bones and cube into small bite-sized pieces; set aside. Preheat oven to 35o degrees. While the chicken is cooking, steam the fresh broccoli for 4-5 minutes, rinse with cold water and drain. 2. In a heavy-bottom medium saucepan, heat the oil and butter. Add the onion and saute until tender but not browned. Add the flour and stir constantly to remove the raw flour taste. Stir in the chicken broth and milk. Stir often being careful to not let it burn on the bottom. 3. Add the sherry, if using, salt and pepper, and nutmeg. Keep stirring until thick and bubbly. Add more milk or heavy cream if the sauce is too thick. 4. Remove from heat and stir in the mayonnaise and mustard. Add half of the cheese and stir to melt. 5. In an ovenproof casserole or gratin dish, layer the broccoli and chicken. Pour the sauce over the chicken and sprinkle the remaining cheese over the sauce. 6. Bake in preheated oven for 20 minutes covered and 10 minutes uncovered. After travelling over the weekend I was ready to prepare a home-cooked meal. I bought broccoli and decided to make a casserole with ham and cheese sauce for dinner. I knew that my daughter and her kiddos would be visiting in the evening for a while and I could assemble the casserole ahead of time and bake it quickly in the oven when we were ready to eat. That worked well. While the casserole was warming up, all I had to do was heat some stewed tomatoes on the stove, slice some bread and presto! Dinner was nearly done. I hadn’t been able to get to our local farmer’s market to buy some good tomatoes yet so canned ones had to do. I did manage to get a loaf of bread baked earlier in the day (I can hardly stand to eat grocery bread any more) so we had good bread to mop up the cheese sauce on our plates. Ham, broccoli and cheese go so well together. There are all sorts of combinations possible. Broccoli soup flavored with ham or bacon and cheddar is delicious. Sometimes I make an open face sandwich with Canadian bacon on a toasted English muffin with a few broccoli spears and drizzled with cheese sauce. Yesterday’s casserole was so simple that I prepared it in about 15 minutes, cooled it on the counter for a few minutes, then covered it and stored it in the frig for a couple hours before baking it. Here’s the recipe. 1. Steam broccoli 4-5 minutes until just tender (I put it in a large bowl, partially covered with plastic wrap, and microwaved it for 4 minutes. 2. In the meantime, melt butter in a medium sized heavy saucepan. (If using onion, saute it in the butter until soft.) Add flour and stir over heat for a few minutes to cook the flour. 3. Whisk in milk, salt and pepper to taste, dry mustard, paprika. Continue cooking a few minutes until thick and bubbly. Stir in the cheese until melted. 4. Layer the broccoli in the bottom of an 11 x 7 baking dish, or one of similar size. Next, layer with the ham pieces. My sister and her husband live in Brooklyn where they enjoy the availability of many ethnic restaurants. They are both adventurous people, both in travel, and in culinary endeavors. They have spent time in India, Sri Lanka, Thailand, and Cambodia. Ellen has been visiting Sri Lanka since the early l970’s where she spent nearly a year studying dance. She has returned there several times both to visit old friends and to continue her studies as well as to film a documentary on Sri Lankan rituals and festivals. Bruce is currently back in Thailand where he is working with his Thai friends on art projects, mainly a beautiful mural depicting Thai and Cambodian folklore. I have seen portions of the work and it is very impressive. In a month or so, he and Ellen will be going to Cambodia for more work on the project and, I believe, a showing of his work. For several years, Ellen worked at the James Beard House where she was able to meet some of the best chefs in the country. The Foundation’s mission is to celebrate, preserve, and nuture America’s culinary heritage and diversity in order to elevate the appreciation of our culinary excellence. She observed food preparation and service and had a valuable education in American cuisine at its best. Ellen is an intuitive cook, much more so than I. I like the security of recipes, but Ellen has more of a natural instinct with an adventurous flair. She occasionally caters events both large and small and tackles each job head on successfully. Cooking over an open fire? No problem. For several years, while renovating their vacation home in the Adirondacks, the lack of a kitchen did’t stop her from preparing delicious meals. We had bacon and blueberry pancakes, corn chowder and more all prepared over an outdoor fire pit. Here is the broccoli recipe from Ellen that I described in the prior post. Use your own intuitition for the amounts. Go easy on the sesame oil (the dark variety) unless you know you like a lot of it. Blanch brocolli spears by dropping in boiling salt water for 3 -4 minutes. Then shock with ice water and drain. Put some olive oil & sesame oil in frying pan, add sliced garlic and fresh or bottled ginger slices, and cook for a few minutes, add soy sauce & sugar… to taste. Pour over room temperature broccoli and serve. The bane of many children’s, and adults’, dinner plates, broccoli has always been a favorite of mine. As a child, I ate frozen broccoli spears, sometimes with cheese sauce, and sometimes just plain, but I don’t remember even seeing fresh broccoli in the local groceries. I have found and enjoyed many different casseroles, soups and salads with broccoli as a main ingredient and am always on the lookout for something new. At the bottom of this post, I will give you a recipe for a broccoli salad that often appears on our Christmas Eve Feast menu. This might be the “something new” that you are looking for. 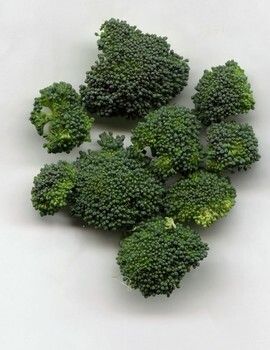 It would be hard to find another vegetable as loaded with nutritional goodies as broccoli. Full of vitamin A, C, B1, B2, B3, B6, iron, calcium, magnesium, potassium, and zinc, it has lots of the trace mineral chromium as well as phytochemicals. Look for dark green flowerets and stems without hollow cores to be sure to get the freshest possible. I always cut a shallow “X” in the bottom of the stems before steaming broccoli, which supposedly helps them cook faster. I never peel the stems, although I see recipes that call for it. Sometimes a sprinkling of Parmesan is all that I do before serving and sometimes I fix a cheese sauce. My sister fixes a delicious broccoli dish with lots of garlic and soy sauce. I’ll get the recipe from her and pass it along later. We used to have a phony “Eggs Benedict” for dinner. I would top toasted English muffins with a poached egg and surround it with broccoli. With cheddar cheese sauce on top, it was a delicious dinner, although not exactly low fat, the way I made the cheese sauce. I had a recipe that was delicious for extremely quick cheese sauce: 1 c. milk, 1 c. mayonnaise, and 1 c. grated cheddar cheese. Put in a saucepan, whisk together and cook over med-low heat, with a stir now and then. Mmmmmm. That served 4 people but was still rather heavy on the fat and calories. An optional addition to the above is a slice of canadian bacon, or even ham chunks added to the cheese sauce. Broccoli is what made that dish attractive as well as tasty, and added some good nutrients to boot. large head broccoli, cut into florets, thickest part of the stems reserved for soup. In a large mixing bowl, mix mayonnaise and green goddess dressing with seasonings and bacon pieces. Add the broccoli, cauliflower and onion and stir gently. Refrigerate overnight or at least 6 hours. Garnish with tomato wedges or cherry tomatoes, halved if large, just before serving. * Green Goddess dressing can be hard to find. I use 7 Seas when I can find it. If I can’t find it, I sometimes substitute creamy italian dressing, but look for the green goddess, it makes a difference. But here is a recipe for making your own.